Keep up to date with news, upcoming events, ongoing seminars and series, and recent faculty publications. 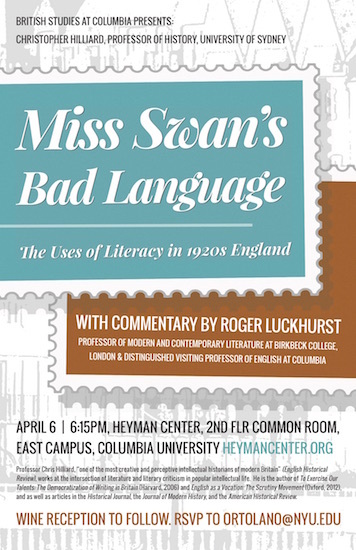 "Miss Swan's Bad Language: The Uses of Literacy in 1920s England," Christopher Hilliard, Professor of History, University of Sydney, with commentary by Roger Luckhurst, Birkbeck College, London & Distinguished Visiting Professor of English at Columbia. Wine reception to follow. Wednesday, April 6, 6:15pm-7:45pm, Heyman Center. The British History Seminar brings together faculty and graduate students with an interest in British history at Columbia and other institutions in the greater New York area. The seminar meets monthly to discuss work in progress by a member of the group, a paper by a visiting speaker, or a recent book of interest to the group as a whole. In 2015-6, the seminar is chaired by Christopher Brown and Carl Wennerlind. If you would like to receive announcements of forthcoming meetings, please contact the seminar's rapporteur, Alma Igra at ai2298@columbia.edu. All events take place in Fayerweather 411, Columbia University at 5:30 pm unless noted otherwise. "The Rules of the Game: The Control and Decline of Respectable Anti-Immigrationism." "'His Majesty's Suffering Church': The American Emigre Clergy in Britain"
"Words That Disturb the State: Hate Speech and the Lessons of Fascism in Postwar Britain." Melding her experiences as reader and critic, Davidson opens new vistas onto works by Jane Austen, Henry James, Marcel Proust, and Thomas Pynchon; adds richer dimension to critiques of W. G. Sebald, Alan Hollinghurst, Thomas Bernhard, and Karl OveKnausgaard; and allows for a sophisticated appreciation of popular fictions by Stephen King, Neil Gaiman, Lionel Shriver, George Pelecanos, and Helen DeWitt. She privileges diction, syntax, point of view, and structure over plot and character, identifying the intimate mechanics that draw us in to literature's sensual frameworks and move us to feel, identify, and relate. Davidson concludes with a reading list of her favorite titles so others can share in her literary adventures and get to know better the imprint of her own reading style. How did an animal product that spoils easily, carries disease, and causes digestive trouble for many of its consumers become a near-universal symbol of modern nutrition? In the first cultural history of milk, historian Deborah Valenze traces the rituals and beliefs that have governed milk production and consumption since its use in the earliest societies. Covering the long span of human history, Milk reveals how developments in technology, public health, and nutritional science made this once-rare elixir a modern-day staple. The book looks at the religious meanings of milk, along with its association with pastoral life, which made it an object of mystery and suspicion during medieval times and the Renaissance. As early modern societies refined agricultural techniques, cow's milk became crucial to improving diets and economies, launching milk production and consumption into a more modern phase. Yet as business and science transformed the product in the nineteenth and twentieth centuries, commercial milk became not only a common and widely available commodity but also a source of uncertainty when used in place of human breast milk for infant feeding. Valenze also examines the dairy culture of the developing world, looking at the example of India, currently the world's largest milk producer. Ultimately, milk's surprising history teaches us how to think about our relationship to food in the present, as well as in the past. It reveals that although milk is a product of nature, it has always been an artifact of culture. Modern credit, developed during the financial revolution of 1620-1720, laid the foundation for England's political, military, and economic dominance in the eighteenth century. Possessed of a generally circulating credit currency, a modern national debt, and sophisticated financial markets, England developed a fiscal-military state that instilled fear in its foes and facilitated the first industrial revolution. Yet a number of casualties followed in the wake of this new system of credit. Not only was it precarious and prone to accidents, but it depended on trust, public opinion, and ultimately violence. Carl Wennerlind reconstructs the intellectual context within which the financial revolution was conceived. He traces how the discourse on credit evolved and responded to the Glorious Revolution, the Scientific Revolution, the founding of the Bank of England, the Great Recoinage, armed conflicts with Louis XIV, the Whig-Tory party wars, the formation of the public sphere, and England's expanded role in the slave trade. Debates about credit engaged some of London's most prominent turn-of-the-century intellectuals, including Daniel Defoe, John Locke, Isaac Newton, Jonathan Swift and Christopher Wren. Wennerlind guides us through these conversations, toward an understanding of how contemporaries viewed the precariousness of credit and the role of violence,war, enslavement, and executions in the safeguarding of trust. Human rights offer a vision of international justice that todayAs idealistic millions hold dear. Yet the very concept on which the movement is based became familiar only a few decades ago when it profoundly reshaped our hopes for an improved humanity. In this pioneering book, Samuel Moyn elevates that extraordinary transformation to center stage and asks what it reveals about the idealAs troubled present and uncertain future. For some, human rights stretch back to the dawn of Western civilization, the age of the American and French Revolutions, or the postAWorld War II moment when the Universal Declaration of Human Rights was framed. Revisiting these episodes in a dramatic tour of humanityAs moral history, The Last Utopia shows that it was in the decade after 1968 that human rights began to make sense to broad communities of people as the proper cause of justice. Across eastern and western Europe, as well as throughout the United States and Latin America, human rights crystallized in a few short years as social activism and political rhetoric moved it from the hallways of the United Nations to the global forefront. It was on the ruins of earlier political utopias, Moyn argues, that human rights achieved contemporary prominence. The morality of individual rights substituted for the soiled political dreams of revolutionary communism and nationalism as international law became an alternative to popular struggle and bloody violence. But as the ideal of human rights enters into rival political agendas, it requires more vigilance and scrutiny than when it became the watchword of our hopes. Modernism is typically associated with novelty and urbanity. So what happens when poets identify small communities and local languages with the spirit of transnational modernity? Are vernacular poetries inherently provincial or implicitly xenophobic? How did modernist poets use vernacular language to re-imagine the relations between people, their languages, and the communities in which they live? Nations of Nothing But Poetry answers these questions through case studies of British, Caribbean, and American poetries from the 1920s through the 1990s. With a combination of fresh insights and attentive close readings, Matthew Hart presents a new theory of a "synthetic vernacular"-writing that explores the aesthetic and ideological tensions within modernism's dual commitments to the local and the global. The result is an invigorating contribution to the field of transnational modernist studies. Chapters focus on a mixture of canonical and non-canonical writers, combining new literary histories--such as the story of how Melvin B. Tolson, while a resident of Oklahoma, was appointed Poet Laureate of Liberia--with analyses of poems by Gertrude Stein, W. H. Auden, Ezra Pound, and T. S. Eliot. A History of Victorian Literature offers a wide-ranging narrative overview of literature in Great Britain between 1830 and 1900 exploring the extraordinarily varied literary production and reception of the Victorian age, with fresh considerations of major figures and new attention to neglected and less familiar careers. Drawing on a broad range of contemporary scholarship, this book analyzes the development of literary forms-the novel, poetry, drama, autobiography and critical prose-in conjunction with major developments in social and intellectual history. The Victorian period was a golden age for the study of Milton. Yet the influence of Milton on poetry, and on literature more generally, during the period is often obscure. Victorian writers rarely display the overt, self-conscious engagement with Milton that typified so much Romantic writing earlier in the nineteenth century. In Milton and the Victorians Erik Gray argues that this shift represents not a breach but an expansion: if Milton's influence seems less remarkable than before, it is due not to his absence but to his pervasiveness. Through detailed consideration of works by Elizabeth Barrett Browning, Christina Rossetti, Matthew Arnold, Alfred Tennyson, and George Eliot, Gray shows how Victorian writers tended to draw upon the less sublime, more understated elements of Milton's writings. The Enlightenment commitment to reason naturally gave rise to a belief in the perfectibility of man. Influenced by John Locke and Jean-Jacques Rousseau, many eighteenth-century writers argued that the proper education and upbringing—breeding—could make any man a member of the cultural elite. Yet even in this egalitarian environment, the concept of breeding remained tied to theories of blood lineage, caste distinction, and biological difference. Turning to the works of Locke, Rousseau, Swift, Defoe, and other giants of the British Enlightenment, Jenny Davidson revives the debates that raged over the husbandry of human nature and highlights their critical impact on the development of eugenics, the emergence of fears about biological determinism, and the history of the language itself.